I finished the eighth episode of Season One of The Wire late last night. I've been working through this series since I picked up all 60 episodes from Andrew last week. This show is so compelling, so wonderfully written and so brilliantly paced that I simply can't get enough. Like the drugs portrayed on the screen, I just want my next hit. It's sort of the best of The Sopranos blended with the best of Homicide: Life on the Street. Every word has weight, so you're forced to pay very close attention. I'm addicted. I'll write a review after I wrap up each season. If it wasn't for work, sleep and these damn kids, I'd have the whole series done by next weekend. Oh yes it is addictive. Now the first season is free. After that I want a little somthin' somthin'. Come on Bubs, you know you want it. I'm re-posting it here, because it's dead-on. The Sopranos, Six Feet Under and The Wire are probably my three favourite shows from the past decade! Though white people have a natural aversion to television, there are some exceptions. For white people to like a TV show it helps if it is: critically acclaimed, low-rated, shown on premium cable, and available as a DVD box set. If you attempt to talk about an episode they have not seen yet, they will scream and cover their ears. In white culture, giving away information about a film or TV series is considered as rude as spitting on your mothers grave. It is an unforgivable offense. Recent series that have fallen into this category include The Sopranos, Six Feet Under, and most recently The Wire. So why do they love it so much? It all comes down to authenticity. 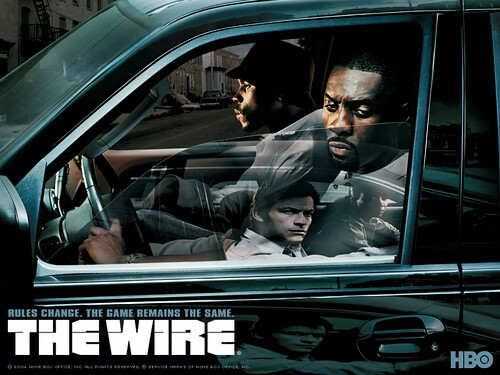 A long time ago, someone started a rumor that when The Wire is on TV, actual police wires go quiet because all the dealers are watching the show. Though this is not true, it seems plausible enough to white people and has imbued the show with the needed authenticity to be deemed acceptable. The popularity of this show among white people has create a unique opportunity for personal gain. If you need to impress a white person, tell them you are from Baltimore. They will immediately ask you about The Wire and how accurate it is. You should confirm that it is “like a documentary of the streets,” the white person will then slowly shake their head and say “man” or “wow.” You will be seen in an entirely new light. If you are not from Baltimore but the white person you are talking to is, they might start asking you a lot of questions. In this situation, you should just say you left when you were young but you still have a lot of cousins there but you don’t like to go back to visit. This will remove all doubts and they can go back to telling you about how John from Accounting needs to “stop snitching” about their two hour lunch breaks. These damn kids? Wait till they grow up. It doesn't get better only different.